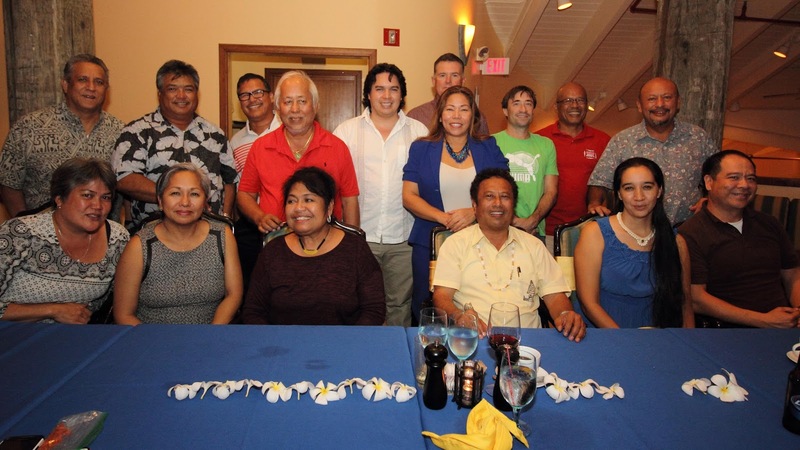 The Island Voices shared the stage with Palau President Tommy Remengesau Jr at a tourism summit that took place in Saipan on Thursday, January 28. Saipan Ambassador Diego Benavente and secretariat Angelo Villagomez spoke to the summit's theme, "One Ocean, One Heart." The Marianas Variety and the Saipan Tribune reported on the speakers and the summit. INTERNATIONALLY acclaimed environmental leader Palau President Tommy E. Remengesau Jr. reminded CNMI students from various elementary and high schools on Thursday about the importance of preserving the ocean for future generations. In his keynote message during the Marianas Tourism Education Council Tourism Summit at the Pacific Islands Club pavilion, Remengesau said the ocean is the heart and soul of Micronesia which includes Guam, the CNMI, the FSM, the Marshalls and Palau. Remengesau said the ocean is the goose that lays the golden eggs and it is the responsibility and duty of the people, including students and the younger population, to take care of it for the next generations. “The environment is the economy and the economy is the environment. When visitors see the ocean, experience the friendliness and feel the hospitality of islands, they will spend thousands of dollars to come here,” Remengesau said. He told the Marianas Youth Welcome All Visitors Enthusiastically or MY WAVE Club members that he declared 2016 the Year of the Youth in Palau. “It is important that in Micronesia and the other Pacific Islands, the youth start as young as possible in creating that feeling of love, concern, protection and knowing that every single one of you is taking care of the goose that lays the golden egg and that’s our ocean and environment,” Remengesau said. Everyone should benefit from the tourism industry beginning with the younger generation, he said. Remengesau was named Champion of the Earth in 2014 by the United Nations Environmental Program for spearheading initiatives that aim to protect Palau’s biodiversity. On Oct. 28, 2015, he signed the Palau National Marine Sanctuary law which designates 80 percent of Palau’s marine protective area — making the island nation the world’s sixth largest fully protected marine area in the world. It was also Remengesau who, in 2005, called for the creation of the Micronesia Challenge to conserve 30 percent of near shore coastal waters and 20 percent of forest land by 2020. Remengesau told CNMI students Thursday that designating 80 percent of Palau’s waters means the preservation of his nation’s food security as it will ensure that the fish population and marine resources will still be available for future generations. The Palau National Marine Sanctuary, he added, is also for their economic and cultural security. He said the remaining 20 percent of Palau waters is still big enough to support local fishermen and provide for their families. Remengesau said Palau is also known as a world shark sanctuary. One shark, he added, is worth about $1.9 million in revenues for its average 60 to 70 year lifetime. Remengesau said the southern lagoon of Palau has world heritage sites that continue to draw visitors each year. In his message, former Lt. Gov. Diego T. Benavente told students that tourism and natural-resource preservation go hand in hand. “This summit is all about our way of life. We are blessed with natural and beautiful resources as big attractions for tourists, and the ocean that surrounds us is one of the reasons why tourists come to visit,” Benavente said. He said as a lawmaker, he worked on bills that were closest to his fisherman’s heart — measures that protect the ocean, create more marine protected areas and preserve ocean species. “Our natural resources are the foundation of our tourism and economy so our job is to protect the delicate balance. I urge all to support efforts in the CNMI to protect the ocean,” Benavente said. The other summit speakers were Dr. Peter Houk, associate professor of marine biology from the University of Guam, and Pew Charitable Trusts officer Angelo Villagomez. PIC general manager Hiroki Sugie was given special recognition for his support and participation in the Tourism Summit and other tourism activities.